Announcing a large rally outside the Indonesian Embassy in London. 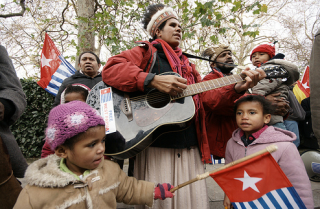 6th July will mark exactly 15 years to the day since the Biak Massacre, when over 200 innocent Papuan men, women and children were murdered by the Indonesian army for peacefully raising their national flag. Over 200 people are expected to attend this demonstration. There will be music from Papuan musicians and speeches from speakers including Benny Wenda, Peter Tatchell as well as various international human rights and advocacy groups. On 6th July, 1998, Papuans from the island of Biak raised the Morning Star Flag on top of their town’s water tower. At 5:30am, whilst the people were still sleeping beneath their flag, the Indonesian army mercilessly opened fire upon the innocent people for 4 hours. The army then raided civilian houses and forced everyone out at gunpoint onto two naval vessels and beat, raped tortured them in front of their families in ways too brutally and graphic to describe. The two hundred people were then mutilated and dumped at sea, two of the bodies found was of a woman still clutching her tiny child.